Although they are primarily used for serious indoor and outdoor projects, laser levels can do other meticulous jobs that result in the inside of the home looking absolutely gorgeous. Try to see it this way, you have a lot of pictures and artwork you want to hang up around the house. Some of would look good really good hanging next to each and you want them in a straight line. However, the issue is able to nail the picture to the wall while holding the hammer and nails. You also have to try and hold the picture too. In case you are wondering how you are going to accomplish that, there is a solution. You probably already have this nifty tool around your house. It is called the laser level. If you have some experience in using a laser level then you should be able to hang up your pictures with no problems. Let’s take a look at it. 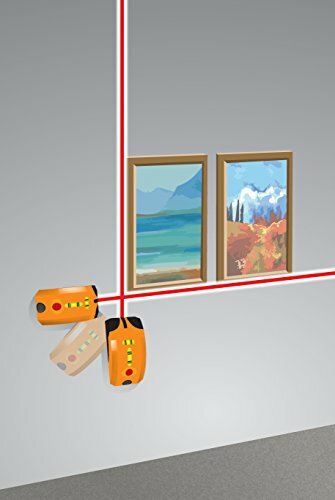 Why Use A Laser Level To Hang Pictures? The answer to this question is quite simple. 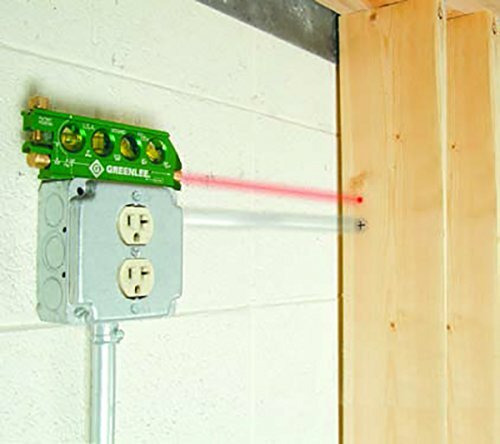 Laser levels can be mounted on any wall and they also come on tripods, which means you can use either one so one of your hands can be used to hammer the nail into the wall with precision. If you want your pictures angle a certain way, laser levels are perfect for that as well. For example, if you different size frames but want to hang them side by side, using the laser level can mark the spot on the wall so you can get that perfect hanging position. Just using a basic laser level can help you do a simple task of putting up row to row frames and aligning with precision, and it makes the room look nice and homey. 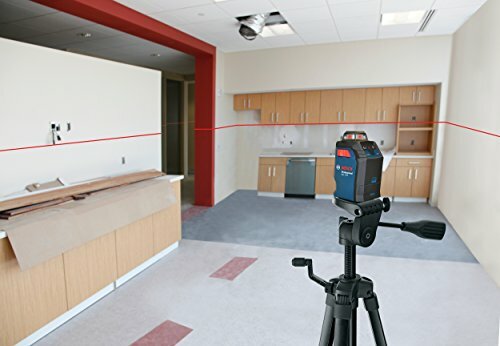 Most laser levels can go up to 250 ft depending on what you are doing and what you need it for. Since you are only hanging up pictures, you only need that with a range of 20 ft. These can be arranged for any angle and put itself back in place to a designated degree. In case you were wondering what the sliding markers are for, these are vials that horizontal and vertical that allow you to mark where your holes are going to be once they are locked in place. If you have buried nails or studs in your walls that you can’t see, the stud finder will locate them for you. 1. Measure the frame and the wall that is being used for this project. You want to make sure it is done correctly, so it will look nice when you’re done. 2. Look at how high you want the frame to go. This is critical. You do not want it too high where you can’t reach it, but you don’t want the children to accidentally knock it off the wall either. 3. Make a mark anywhere in the measurement you did in step 1. Make sure the mark is horizontal. 4. It is time to get the laser level. Turn it on, and make sure you properly place the laser beam on the horizontal mark you made in step 3. 5. In order to get the bubble in the vial to sit in between the black lines, you have to rotate the laser around the mark you made and the point that it meets. It needs to be adjusted. 6. At this point, it is time to mount the laser level on the wall, after it has leveled off and had passed through the mark you created. You will need either putty or some reliable suction cups to keep on the wall. 7. After you have measured the hanging point and the distance from it, measure where the laser is to the point where you will hang the frame and make a mark. 8. Where you made the mark at on the wall is where you will get the hammer nails to start making a hole. 9. Now you can place the frame on the nail you have hammered into the wall, and line the picture up with the laser. When you are hanging your pictures, you want to look just right. However, if you have a wall that curves or a ledge, you need a more precise measurement so that they hang perfectly up and not look tacky. You would need to measure the top of the frame to the distance of where you are going to hang it. This will get you the best result when leveling and lining it up. 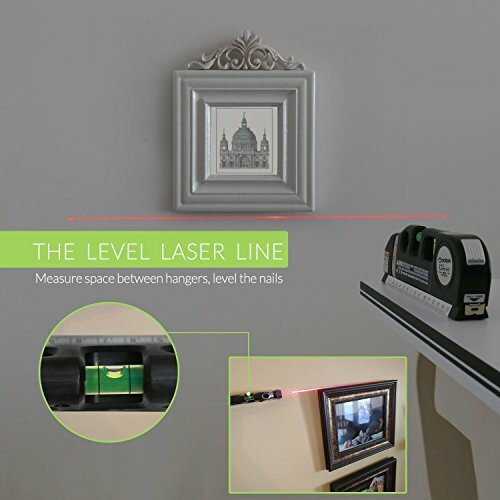 There are some very good laser levels that stand out as being the best ones to use for hanging pictures. 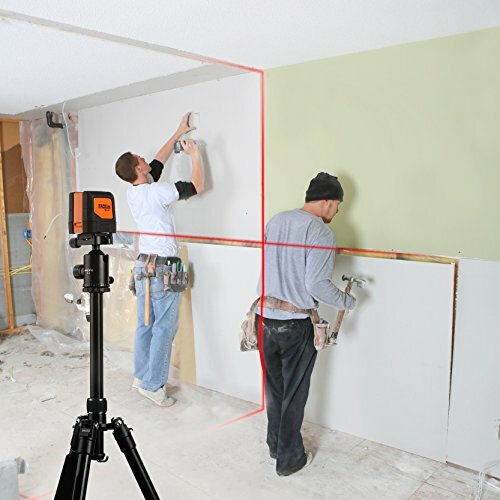 If you get the Huepar Self-Leveling 360 Laser Level, however, you are getting a clear winner. This laser level meets all professional requirements and is self-leveling at a time of three seconds. It comes with outdoor pulse modes that can easily be switched and a locked pendulum that will protect the sensitive area of the laser for safety. That makes it easier to transport too. It comes in a soft carrying case and has a low battery indicator switch. There is a bright horizontal beam that is 360 degrees and a couple of vertical beams that if used properly will bring out the laser. In the event you decide that the Huepar Self-Leveling 360 Laser Level is not what you want, there are other laser level options. If you are looking for pinpoint accuracy, then this is the laser level to get. 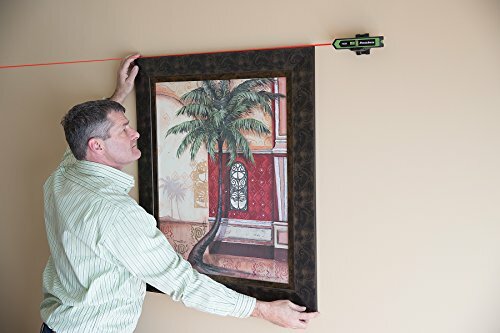 It comes equipped with a wall mount so you don’t have to find auctions or putty to keep on the wall while measure for accuracy to hang your pictures. Also, the Torpedo comes with an extra coating that keeps it from getting damaged it falls to the ground. There are two bubble vials in the side of it to help achieve accuracy along with a red beam light or dot to point out the mark correctly. Aside from hanging pictures, you can use it for installing chair molding, hanging cabinets, mounting TVs, and installing wallpaper borders. Are you wanting to hang pictures in your stairwell? You can not do it without this Black and Decker tool. This is perfect for that sort of job and other unique areas where you want to get creative in hanging pictures. It comes with a rotating walm atchment and the two light up bubble vials are extra large. You will find this laser level very simple to use. All you have to do is attach to the wall and point it in the direction you need to go in for an accurate straight line. You can hange your pictures from there. This laser level works better indoors which means it works good for hanging pictures. It has its own mounting device that you can use to put it on a tripod or wall stud. Once you have it mounted you can turn it at 360 degrees for that perfect straight line that need to hang your photos up. If it happens to be unle eled or out of range, it will alert you. 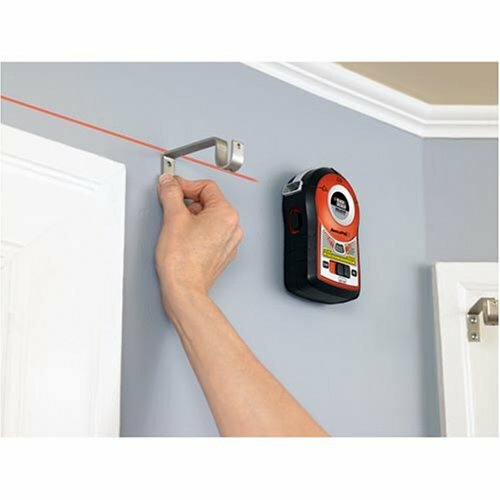 This laser level is designed specifically for picture hanging, but it does come with a multi-purpose tape measurer. It won’t leave a mark on your walls and will take care of anyeveling and alignment problems. You can do the picture hanging projects not only ITV accuracy but also speed simply because picture hanging is its only function. 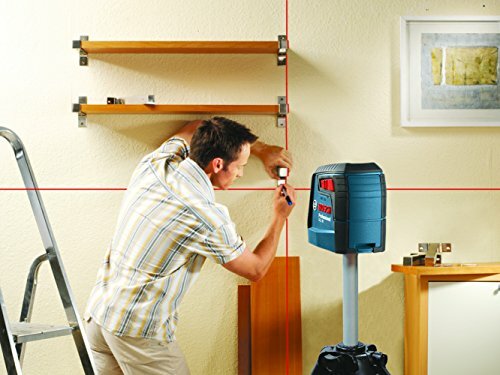 Bosch is known for being the laser level giant and this particular product does not disappoint. You can have a whole room lined up from one setup point that fast and behindoing the work it takes to get your pictures on the wall with ease. Bosch is one of many top of the line laser levels and this is why. This multipurpose Laser Level has an 8-inch tale measure built in to help you get the accuracy you need for gaming your photos or artwork up. You can even turn the laser light on or off with a switch. It comes with a screwdriver and beam-adjusted tool. Here we are with another Bosch Laser Level designed to project two lines for a variety of level and alignment uses. It comes with a smart pendulum system that makes it self-leveling and comes with an out of level indicator. You do not have to clamp this device to the wall to get an accurate line for hanging your pictures. You can also use it when you want hang your photos in the stairwell. Just clamp it anywhere in the area you are working in and it will give you a precise straight line on which you can do your project. If you are wanting a laser level that can adjust itself while self-leveling, this is the tool you need. It comes with a backlight so that you can see your angle clearly illuminate for accuracy. To keep from being damaged, it comes with a rubber overmold. This is perfect for hanging anything including pictures in a staircase. This laser level comes with earth magnets that makes it attach to anything, including steel. So if you wanted to hang up your pictures with this one, you can. It has a range of 80 yards and can work on all planes. This laser level comes with four vials and the accuracy along with its calculations are very simplified. Now this particular laser level is fun to work with because it comes in the form of a mouse. You just put it on any surface and it becomes hands free right after. It does not leave any marks or holes and will restock when you need it to. So hanging up your pictures will be without the hassle. There is even a button to turn on the laser beam to give an accurate line measurement. When using a laser level, please keep it away from your children and pets, the liquid in the bubble vials will poison them or worse. Also, do not look at the laser beam by pointing it into your eyes. It will do some serious damage that can not be reversed and will leave you blind. Make sure to keep put away where on one can get harmed by it. You want to use this product for what it was intended and nothing else. This will definitely give you peace of mind. As you can see using a laser level to hang your pictures is a great idea. You will get the accuracy you need and have fun in the process. All of these laser levels will help you get the job done. Your walk will not look tacky at all if you use the laser level correctly. Should you have trouble, well some of the laser levels mentioned can easily help you out. This is true if you need one that can self-level and guide you in putting up any pictures in a stairwell. You can get the most precise angle with the heache smdchassle of the old fashioned measurement of the wall. With some of them coming with tape measures, you will not need that as an extra tool in your hand. Using a laser level to hang up your pictures is an easy project if you know what you are doing. With the right tool, you can have that bare wall liking nice and your pictures will hang with precision. 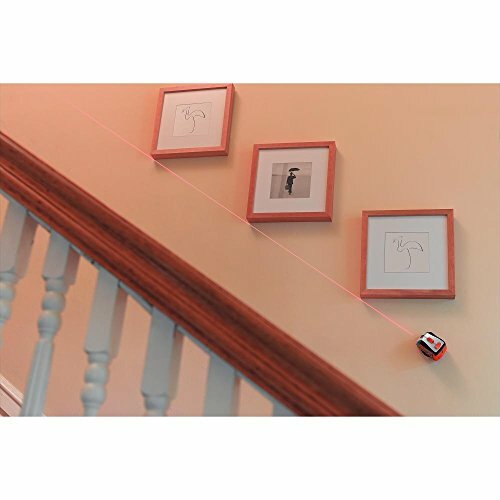 Having a laser level will make your house look like a home, when you are able to hang up your most precious memories in a very creative or uniformed way. So when you get ready to do this project, consider using a laser level. You will be glad you did.